A new research might change how expecting parents will be able to see their unborn child. Ultrasound photos have been the only way to do that for years and they are of very poor and blurry quality. Luckily, a team of Brazillian researchers found a way to examine a fetus in VR by transforming ultrasound and MRI data into virtual 3D models of the baby. Sequentially-mounted MRI slices are used to construct an accurate 3d model of the womb, and the fetus can then be viewed with an Oculus Rift VR headset. The user can view the baby from various angles and even hear the baby's heartbeat. This technology can help doctors detect abnormalities and malformations a lot more accurately, and give them a better understanding of the baby's anatomical characteristics by allowing doctors to see a detailed visualization of the baby's internal structure. 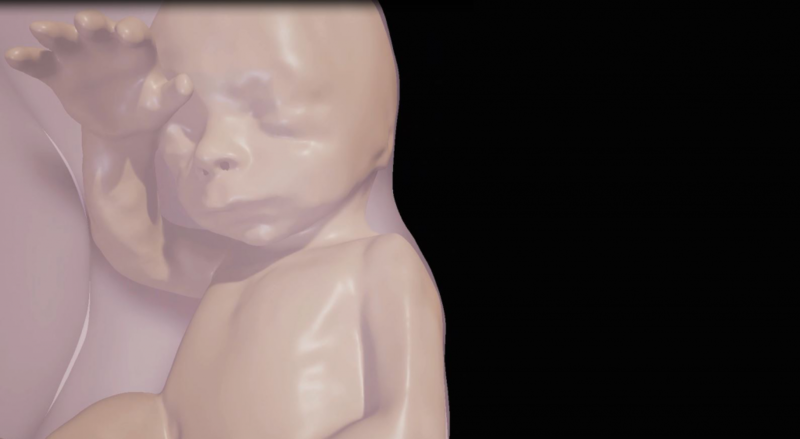 3D images will help the parents follow the development of their baby, as well as provide vital morphological information for doctors who have to make treatment decisions. The technique has already been used in Rio de Janeiro to detect an abnormality that later required postnatal surgery. Authors on the study are Heron Werner M.D., Ph.D., Bianca Guedes Ribeiro, M.D., Jorge Lopes, Ph.D., Gerson Ribeiro, Pedro Daltro, M.D., Tatiana M. Fazecas, M.D., Renata A. Nogueira, M.D., and Leise Rodrigues, M.D.